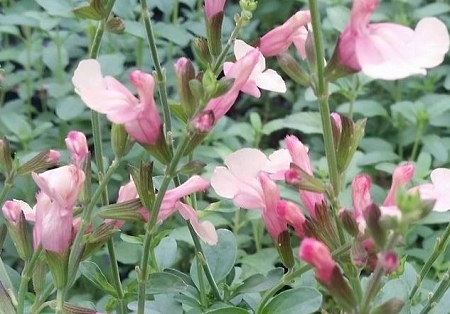 Suncrest Autumn Moon Salvia (s. greggii x jamensis 'autumn moon') PP 24,106 - Very ornamental hybrid salvia has dark stems and calyxes with pastel blooms in a range of color from pink/peach to pale yellow/cream. Similar to Sierra San Antonio in color but with a tidier growth habit like other Suncrest series plants. Blooms Spring through Fall attracting hummingbirds and other pollinators. Easy to care for plant is very drought tolerant once established and reportedly deer resistant. Forms a small bush approx. 3' x 3'. Perennial zones 7-9. One live starter plant in 2.5 inch container.